Sometimes you need to cut corners and cheat a bit. This recipe is a good indication of what you can get even if you take some shortcuts. Coming home and having 95% of the cooking done by itself can be a good feeling after a long day at work. So, without any more babbling - this is how I saved myself some kitchen time today. Line the bottom of your slow cooker with the chicken thighs. Spread the onions on top and pour the sauce evenly over it all. Cook on Low for 5 hours or until the chicken is properly cooked through. Fish out the chicken pieces and shred them with either your hands or two forks. Put the shredded chicken in a bowl. Once all the chicken pieces have been shredded spoon liquid form the slow cooker over it until it reaches a consistency you like. Split the rolls, pop some chicken on each bottom half. 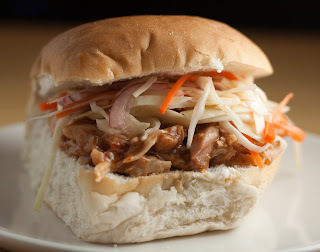 Top with coleslaw and finish the stack with the tops of the rolls . l own a catering equipment business, and a lot of my resturant clients are always looking for good recipes, l will send them here from now on.